Global arrivals to Korea hit the 9.8 million mark, a growth of 11.3% over the previous year. This year’s inbound global figures are likely to top 11 million. Korea and its visitors are still enjoying the designation of 2010-2012 as ‘Visit Korea Year’ and has some notable events to look forward to in the coming months, such as 2012 World Expo Yeosu and another exciting F1 Grand Prix. Korea’s ten UNESCO World Cultural Heritage listed sites have impacted on increasing visitor numbers to Korea, as will Jeju Island’s recent success to become one of the ‘New 7 Wonders’ of the natural world. This entry was posted in Korea, South Korea on 2012/01/27 by Trailsurfer. Here are the flowery spring landscapes, sandy beaches, rocky mountains and quietly stunning historic sites on your new Korean travel bucket list, according to CNN. This entry was posted in South Korea on 2012/01/19 by Trailsurfer. According to the Korea Tourism Organization (KTO), Korea has already registered a record number of visitor arrivals for 2011. As of 1 December 2011, Korea had recorded more than nine million visitor arrivals, already exceeding 2010 arrivals of eight million. Some reasons behind this increase is the rise in popularity of Korean culture, improvements in travel infrastructure and the expansion of Low Cost Carrier market to and from Korea. Another geeky reason is that Korea has emerged a high tech hub showcasing very advanced technology and leading developments in the mobile market. This entry was posted in South Korea on 2011/12/27 by Trailsurfer. 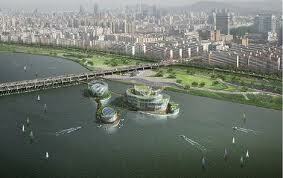 “The Floating Island” three large artificial islets on the Han River opened to the public in April 2011, inviting many citizens and tourists to experience the Seoul landmark. The opening was originally planned for September, but was postponed due to unusually cold weather last winter and a long rainy season this summer. The Floating Island is a group of artificial islets located below Banpo Bridge, a project costing some 96 billion won (approx. 10,5 million US dollars). The entire facility is 9,900 square meters in size, including the connecting bridges. The largest islet Vista will house a 692 seat convention hall for conferences or exhibitions and restaurants. The 3,449-square-meter-wide second island Viva will have event halls for entertainment and the smallest Terra is intended to house water leisure activity facilities. This entry was posted in South Korea on 2011/05/21 by Trailsurfer.